I know there are many people in the world want to learn how to build a Facebook Store to start selling their products or services. Therefore, I take this liberty to write a guide. Hope it can help you. 1. Go http://www.ecwid.com to register. 3. 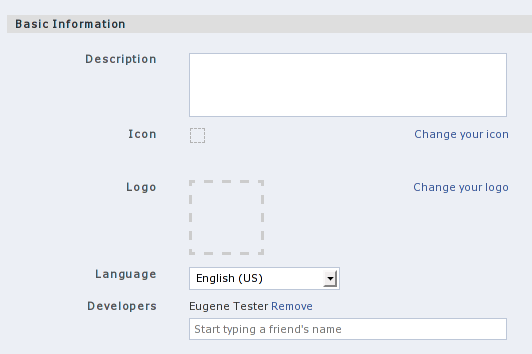 Go http://www.ecwid.com/facebook-commerce to integrate your Ecwid with Facebook. 1. Detect your Ecwid Store ID. 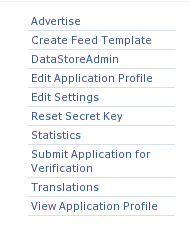 When you log in, page “Dashboard” with section “Getting Started” will appear. “1003” is the Store ID. Note: you will see another number on your page. Use the number from your page as your Store ID. 2. Then go to Facebook Developer App. (it’s assumed you already have a Facebook account). You will see the following form. 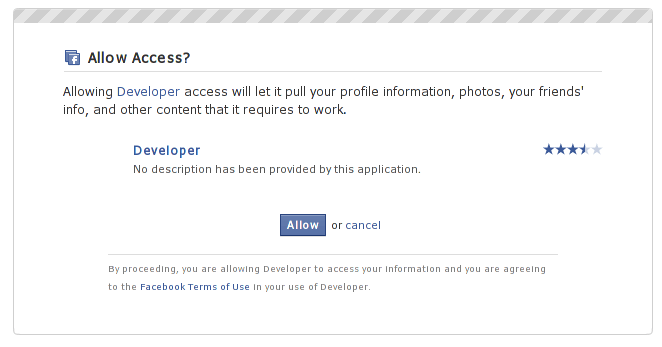 Click the “Allow” button to let the Developer application access your profile. 3. 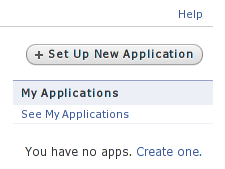 Add a new application by clicking the “Set Up New Application” button. 4. Give your application a name (for example “Super-duper Store”). Accept the Terms of Service and click “Create Application”. 5. Then you should enter some basic information on your application, upload a logo and add a description. 6. We are almost done. 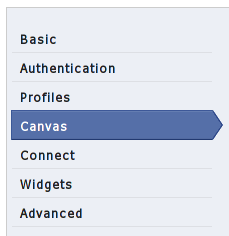 Click the “Canvas” link on the left side of the page. 7. Now you should specify the required URL’s. Canvas Page URL — The base URL of your store page on Facebook. For example, “my-cool-store”. Canvas Callback URL — a special URL that will show your Ecwid store. Replace pattern%STORE_ID% with your real Store ID which you got at step #1 in this URL: http://app.ecwid.com/jsp/%STORE_ID%/simple-store#?. Change width and size of your application. Choose “Full width (760px)” and “Smart size” options in the “Canvas settings” form. 8. Click the “View Application Profile” link. 9. That’s it. Your store is ready! Press to view your Ecwid store. Any user can now add your Facebook app to his/her profile, use it, purchase items, discuss your store with other users, become its fan, etc. It was quickly, wasn’t it?